Join us for this free professional development workshop focused on the life and art of Frida Kahlo. 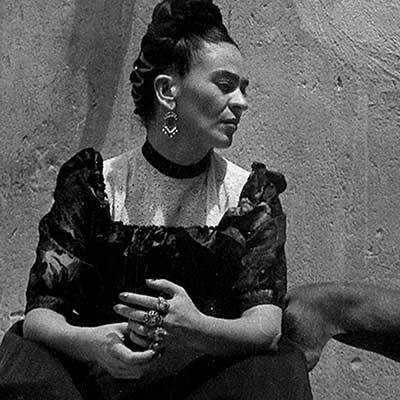 The evening will include private screening of a documentary related to the UNM Art Museum's current exhibition on Frida, followed by a focused, discussion-driven tour of the exhibit. The UNM Art Museum's exhibit, Frida Kahlo - Her Photos, features a rare and extensive selection of Kahlo’s personal photographs. This exhibition was curated from a collection of 6500 images that lay hidden in the Blue House Archive for 50 years, and offers a uniquely intimate glimpse into the life and work of a beloved cultural icon. Frida Kahlo – Her Photoscontains over two hundred previously unseen images, including work by Kahlo, as well as photographs by such creative luminaries as Man Ray, Martin Munkácsi, Tina Modotti, Edward Weston, Nickolas Muray, and Manuel and Lola Álvarez Bravo, among many others. The exhibition promises to reveal new insights into Kahlo’s rich and deeply personal world, and tells a fascinating story of an artist, a place, and an era. This collection of photographs was first revealed to the public in 2007; Mexican photographer and photo historian Pablo Ortiz Monasterio curated the images selected for the exhibition, which encompass six central themes: Origins, ‘Blue House,’ Politic, Revolutions and Diego, Broken Body, Frida's Loves, and Photography. Each section testifies to the important role photography played in Frida Kahlo’s life. Kahlo carefully and meticulously accumulated a vast collection of photographs, and while the collection contains images that undoubtedly belonged to her family and to Diego Rivera, it was Frida’s own diligent efforts that ensured these photographs were preserved for posterity. This event is free, but participation is limited to K-12 educators: in-service and pre-service teachers, educational aides, administrators, and librarians. Certificates of professional development will be given and dinner will be provided.